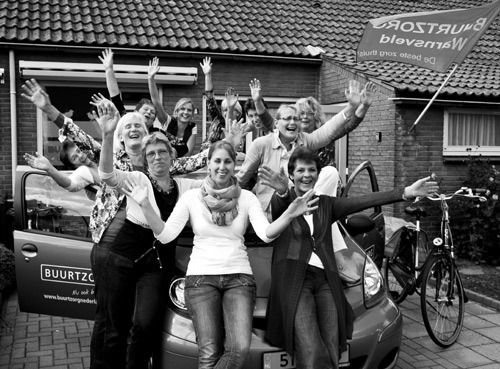 The self-steering and care-driven teams of Buurtzorg: How Lean are they? This article: How Lean is Buurtzorg? What can other organizations learn from Buurtzorg? This home care provider is completely self-steering. There are no managers, they even have no HR-department! Small local teams decide according to their own judgement, what care matches best with the wishes of their customers. De facto, these teams function as mini-companies. On paper, Jos de Blok is the CEO. However, a commanding role does not fit with the concept of autonomous teams. De Blok acts more as a facilitator and guard of the self-steering principles. 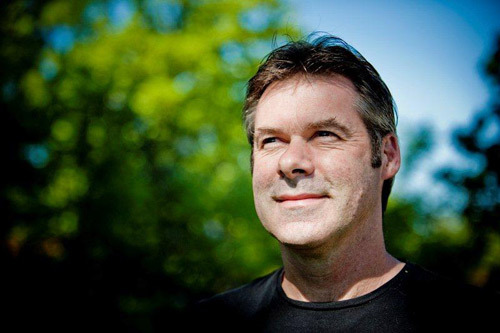 ‘Buurtzorg is a care-driven, instead of a problem-driven organization’, he says. De Blok criticizes the bureaucratic control of the home care in the Netherlands, with the aim to serve nine 'standard products' as cheap as possible. The result is that as much as possible of these ‘care products' are supplied to the customer as long as possible. In other words, the outcome is overconsumption and unnessarily high costs. I addition, it is bad for the customer, who will not revalidate well and/or does not learn to remain as self-supporting as possible. There is a better alternative: more trust should be given to the care organizations. For example a fixed quarterly budget could be alotted per customer type, in combination with a monitoring system to assess the quality of the care. During the interview, Jos de Blok made an intrigueing remark: ‘Lean is terrible’. What makes him think that, while Buurzorg has so many characteristics of a true Lean organization, like coaching leadership, and using the talents of everyone? The highly successful Dutch home care organization Buurtzorg (litterally: care in your neighbourhood) was founded in 2006 by Jos de Blok. Originally he was a district nurse. However, at that time he was an innovation manager, within a large home care company. It turned out to be impossible to carry out the reforms he wanted. Therefore he decided to start his own organization. De Blok had a mission: creating an organization that would no longer 'produce' as much care as possible. He wanted to provide the care that meets the wishes of the customers (the people that need care) best, nothing more, nothing less. Buurtzorg is entirely based on the principle of self organization. As a result, the care professionals can fully develop and use their talents. Managers, intakers and planners are not needed anymore. Small teams of nurses and other care takers, localized in the neigbourhood of their customers, decide according to their own judgement what care matches best. This is done in close cooperation with each customer and the social network around this person. In other words: context- and relationship-directed care is given. This resembles the way in which district nurses used to operate, but not everyone in a Buurtzorg team has the same role. Tasks are distributed across the team members in a natural way. The care to be delivered is more a project than a product, because every customer has different needs. Each team consists of up to twelve persons, operates from a building they choose in the neigbourhood of their customers, and is reponsible for their own results. When a team has problems they can't solve themselves, or when they have questions, they can call the help of a regional coach. This coach does not interfere directly, but gives hints so that the team can find a solution themselves. After this, the team members have become better problem-solvers! The teams are spared regarding administrative tasks. That way, they can give their full attention to care giving. Negotiations with the care administration offices are for example done by a small support center. This center also steps in when problems arise regarding the assesments - which care may a client recieve - by the Dutch office for care assesment (CIZ). On the other hand, everything that touches the primary process, and that can be done by the care professionals themselves, is left to the teams. This even includes hiring new personnel, and executing performance interviews. This high degree of self-steering makes the overhead of Buurtzorg very small. ‘We dont have a human relations department, in fact we don't have any departments at all’, emphasizes De Blok. Jos de Blok: "Internally we don't use the word customers. It gives the wrong impression that we deliver standard care products, with a matching delivery process that one could optimize"
To make the self-steering concept work, several tools to prevent chaos are put to the disposal of the teams. Every team is for example trained in conflict management, and meetings are done via solution driven interaction. During such a meeting everyone can make suggestions, every vote counts. That way, the intelligence of the whole group is utilized. When there are no fundamental objections against a proposal, it will be tried out. This makes it impossible to block innovation. Within Buurtzorg, the people and the development of their skills form the basis for excellent performance. Several characteristics of a true Lean organization are recognizable. First, the customer, the person that needs care, is put central. The teams organize the care themselves, and they both have a grip on - and are responsible for - the results. Second, coaching leadership creates a learning culture. The teams and their members increasingly become better problem-solvers, which makes it possible for them to become even more selfs-steering and self-supporting. Third, innovation takes place in short cycles, new ways of working are tested to see if they are better. And finally, probably the most important thing: The care professionals are given full scope to develop and use their talents, and they get the respect they deserve. In other organizations there often are managers without knowledge and experience in care giving. These can make it almost impossible for the professionals to do their work. Bureaucratic rules, invented by controlling (read: distrusting) managers, can become a huge obstacle. What many people don't know: the top-managers of Toyota, always mentioned as outstanding example regarding Lean, behave a lot like Jos de Blok. They also have a similar background. Toyota-managers often have practical experience with building cars, and they stay in close contact with the shop floor. It is unthinkable that they make decisions sitting behind a desk, based on numbers in spreadsheets. In addition, the CEO of Toyota never is someone who has that job only for a few years. Instead, it is someone who has always worked in Toyota and in the automotive sector. To recognize the Lean-side of Buurtzorg, one has to depart from the modern definition of Lean. This definition puts man, the organization, the Gemba (Japanese for shopfloor, the place were it all happens), and the customers first. Lean is a method in which everyone continuously tries to increase the value that is created for the customer. To that end, the professionals should get all the room, the support, the possibilities and the respect to do this! Still, Lean is often disposed as a method which solely reduces waste in production processes, with reducing costs as the main aim. According to this narrow-minded definition Buurtzorg surely isn't Lean. They should be glad, I would say. De Blok gives an example: ‘Suppose someone has had a stroke. Usually this results in a need for care of x hours. Next, you could set up an organization which provides this care as efficient as possible. The patient could experience this as a good solution, as well as the managers of the care organization involved. So, everybody happy? No! Our professionals say it is not the essence of their job, to make someone dependent on care. They want a quick recovery, to the maximum level that is achievable. To do that, family members should for example be trained to help. Permanent loss of body functions is then prevented as much as possible. In the end, this is not only better for the person who recieves our care, it even is cheaper. It turns out that De Blok struggles primarily with the idea to strive for optimized business processes. Those processes then easily can become a goal in itself, instead of the true mission: adding value for man and society, with the professional skills of the employees. 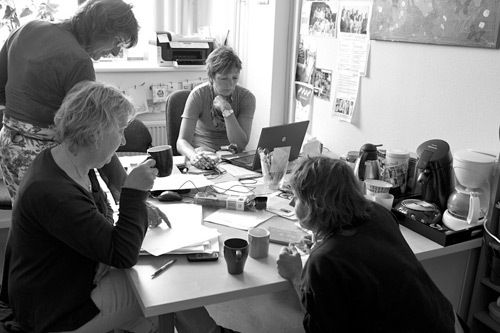 The organizational model of Buurtzorg is based on self management and giving life meaning. The picture shows an enthousiastic team in the city of Warnsveld, The Netherlands. Lean has gotten a bad reputation in home care. It has become associated with time windows and clocks, with for example a reserved time of 2,5 minutes to put on support stockings, and 15 minutes to give someone a bath. Journalists pounced on that with reports like “How much time do we have for Grandma?’. Drinking a cup of coffee with someone would only be seen as waste. Such a one-sided focus on reducing waste has very little do do with the true nature of Lean. In the case mentioned above time registration is not used as a tool to improve, but only as a means to check if the employees work hard enough! Truck manufacturer Scania also works with fixed times to assemble parts, but here these so-called ‘takt times’ have a different aim: They are needed to gear the assembly steps to one another, and to prevent waiting times and intermediary stock. The true goal of Lean is that as much value for the customer is created as possible, and to do that the talents of all the people should have full play. When defined this way, Buurtzorg is pretty Lean. After all, unneeded managers are just another form of waste. Those managers don't add value. On the contrary, they even impede the primary processes. To conclude, self-organization and Lean don't have to be contradictory. This is nicely demonstrated by FAVI, already mentioned earlier as an example of a company with self-steering teams. This automotive supplier also is Lean, but the application of this method is not dictated by managers. The teams decide themselves what Lean tools or other improvement methods they want to use. For that reason, FAVI has no separate improvement office. The expertise to improve their work methods resides within the teams. The government turns out to be a crack formulator of improper incentives, aimed to increase performance. Examples in the Netherlands are the number of graduated students, the number of traffic fines given by the police, and the percentage of trains that leave on time (be it with or without travelers in it!). Controlling home care via the number of indicated hours per "care product", and simultaneously putting pressure on the price of these "products", thus only leads to overconsumption. Of course, the way in which these care products flow towards the customer can be optimized, just as many hospitals did for diagnosis-treatment combinations. However, this is not really Lean, since also in these hospitals the total delivered amount of care increased, sometimes unneccesarily. Therefore, Buurtzorg works different. In consultation with each client and the social network and volunteers around it, they develop a customer-specific care plan. Buurtzorg only has relatively highly-qualified personnel. As a result these professionals can be flexible and multi-tasking. This makes it possible that they perform a broad spectrum of tasks for a client during one visit. This is efficient and it improves the social interaction, because only a few care professionals need to visit each client. Dutch politicians admit that the current way of working, with a lot of bureaucracy and large and distant care offices, needs improvement. They link this to a cost-cutting program, in which many controlling tasks are transferred to municipalities. This would bring "care nearer to the people", they say. Referring to the succes of Buurtzorg, some policians also say that the district nurse should return. De Blok is not impressed. It seems difficult to break the cycle of increasing bureaucratic control. Behavior: how capable is the patient in reducing the symtoms. Status: how severe are the symptoms. According to their own judgement, Buurtzorg teams tune the care to the wishes of each customer, in close consultation with the social network around it. Satisfied customers. Every client is served with as little people as possible visiting their homes. This is not only more efficient for Buurtzorg, it is also appreciated by their customers. As a result, the number of new customers increases. Little overhead. Buurtzorg provides as little care as possible, during a period that is as short as possible, in the interest of the customer. As a result, Buurtzorg can claim relatively few hours per client, but nevertheless they are financially very healthy. How do they do that? Enthousiastic employees. The care providing teams are placed in the center. All other activities should help them to achieve their mission: giving the people the care they really need. There are no managers, only coaches. ICT-applications, such as the Buurtzorg intranet, serve only to ease the work. They are not used to check if the teams work hard enough. Employees of Buurtzorg often choose to work there, because they were dissatisfied with the amount of measurement and control (read: distrust) in other home care organizations. As a result, they are extra enthousiastic to make the Buurtzorg concept a succes. The combination of giving people a lot of freedom and trust generates a lot of positive energy. A lot of care professionals prefer to work a bit harder, instead of becoming frustrated because they are not allowed to give their customers the care they need. Social network customers. Buurtzorg works with customer-specific care plans, developed with the family and friends around the client. These volunteers can perform certain simple care tasks, which creates space for Buurtzorg to provide special care. For this system to function, it is needed that the customer has a social network of people in their neighbourhood, which is not always the case. Role of Jos de Blok. The role of De Blok within Buurtzorg is to some degree comparable with the role that Steve Jobs had within Apple. As described in the book reinventing organizations, the role of the CEO is crucial in a company based on the principle of self-organization. It already occurred several times that under a new CEO, such a company returned to a more hierarchical way of operation. The same might happen if the high degree of confidence that Buurtzorg gives to their teams, is violated somehow. Copying. Other home care organizations copy parts of the organizational model of Buurtzorg. The formation of small home care teams, which are allowed to manage large parts of their work themselves, becomes more and more common. The strong points of the model of Buurtzorg were described earlier in the Dutch book "Uit de schaduw van het zorgsysteem", written by Annemarie van Dalen. We read this book first, and then organized two interviews with Jos de Blok. These were the main sources used for this research article. Let us return to the question in the beginning of this article: What can other organizations learn from Buurtzorg? We see a trend to give the employees on the shop floor, the place where value for the customers is created, increasingly more freedom and responsability. Buurtzorg is an extreme case, they don't have separate managers anymore, management has become an integral part of the autonomous teams. Within Buurtzorg, everthing is aimed to help the professionals to create maximum value. There are no more rules or procedures than needed. Only this is already worth following. The value chain of Buurtzorg is short: de teams can overlook the complete chain until the delivery of care to the customer. Buurtzorg in fact consists of a large number of mini-companies, the autonomous teams. These are connected to each other via the Buurtzorg intranet, and via several supporting services, which are kept as small as possible. Maybe you think that your company cannot be organized this way. However, you can also come a long way, by forming teams for different customer segments, like FAVI did. Those teams than deal with the complete process from quotation until delivery, in the way a quick responce cells function within Quick Response Manufacturing. Is also that impossible or undesirable (for example because very high quality requirements makes working with autonomous teams too risky), than there are still a lot of aspects of the Buurtzorg model that might put an idea in your head. For example, if you ask people to think along about the mission and strategy, like Leaf did when they applied Appreciative Inquiry, this increases their enthousiuasm and involvement a lot! 1) This article is a translation of a publication on our Dutch website. Interviews and research for this article were done during the year 2014.